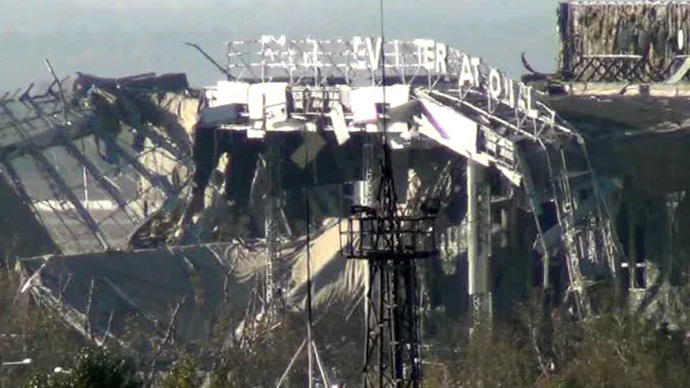 Evidence of regular shelling, battle and bloodshed is what RT witnessed at Donetsk airport. 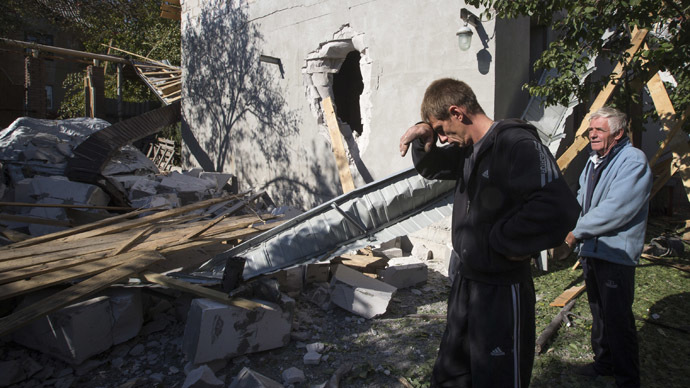 Hundreds of millions of dollars’ worth of infrastructure was reduced to rubble as Kiev's troops and local militias contested it. 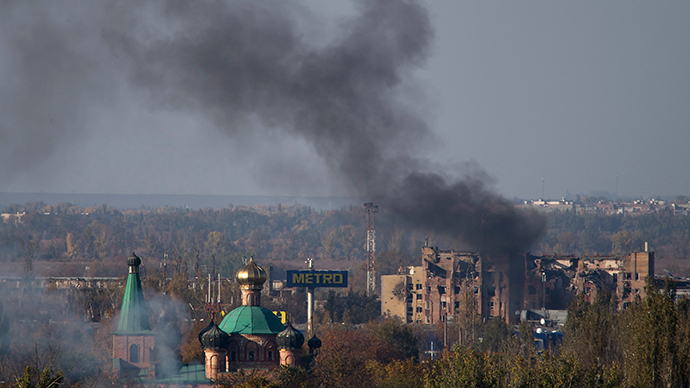 The airport area is “completely devastated” by the lasting conflict, RT’s Roman Kosarev says from the scene. 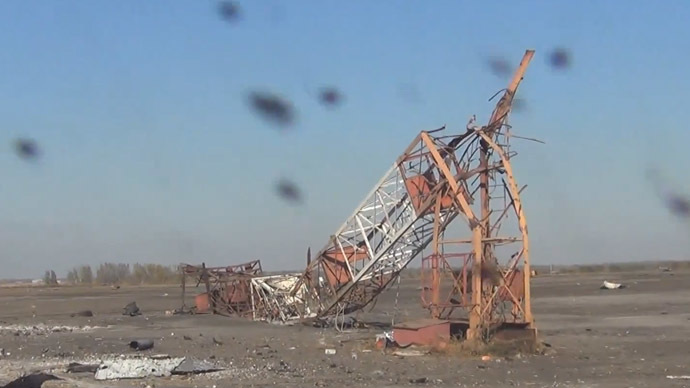 The entire infrastructure of the airport has virtually been obliterated in five months of armed conflict. Wading through rubble, burnt out cars, RT’s crew found husks of buildings and vehicles riddled with bullets, wire frames of internal airport structures, felled trees –the area resembled a wasteland. Crumpled red and white communication towers litter the surroundings. “They are only occupying the airport terminal building and we are surrounding them in a semi-circle, but we can’t quite finish them off,” he added. Donetsk International Airport used to be a busy transport hub handling some 5 million passengers annually. It had a new terminal built at an estimated cost of some $500 million just two years ago for the Euro 2012 football championships. The terminal was named after the great Russian modernist composer, Sergey Prokofiev. Ukrainian government forces have been holding the airport area since the conflict in eastern Ukraine flared up into full-scale warfare in April. In May, it stopped operating as a civilian facility and came under the control of the military. The airport's runways were able to take heavy transport aircraft, allowing new troops and supplies to be airlifted across the hostile area. In mid-June, rebels hit the Ukrainian troops hard, using portable launchers to take down an Il-76 military transport as it was about to touch down at the airport. 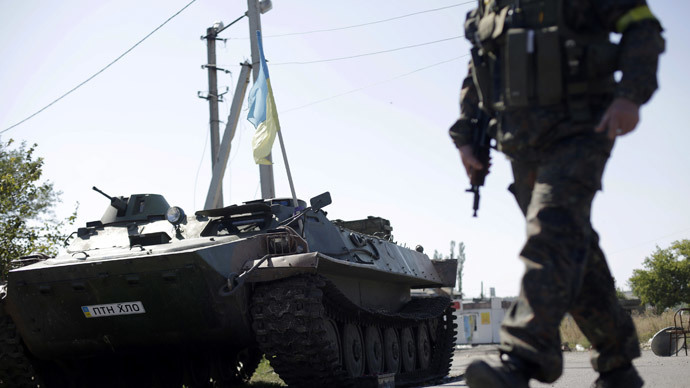 Kiev lost 49 people, most of them elite airborne troops, in the incident. 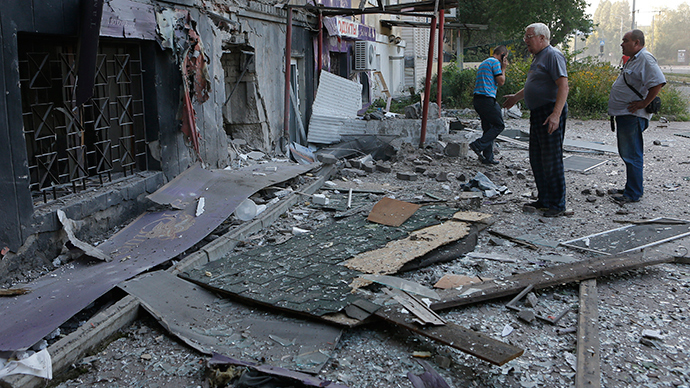 The ceasefire agreement reached on September 5 never really materialized in this area. 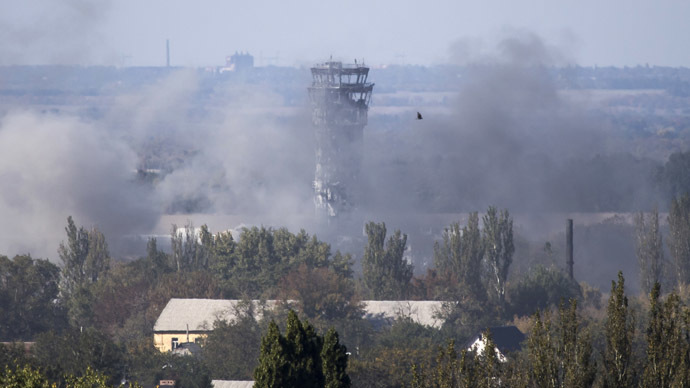 Rebels have been accusing the army troops holding what remains of the airport of launching daily artillery attacks on Donetsk, causing dozens of post-ceasefire civilian deaths. Meanwhile, Kiev says the rebels are constantly violating the ceasefire and attack army positions, even though the truce requires them to fall back and not to try and take more ground. “The situation is highly volatile – the struggle for the airport has been going on for almost five months now,” Kosarev said. The airport is in ruins and no longer serves its original purpose. 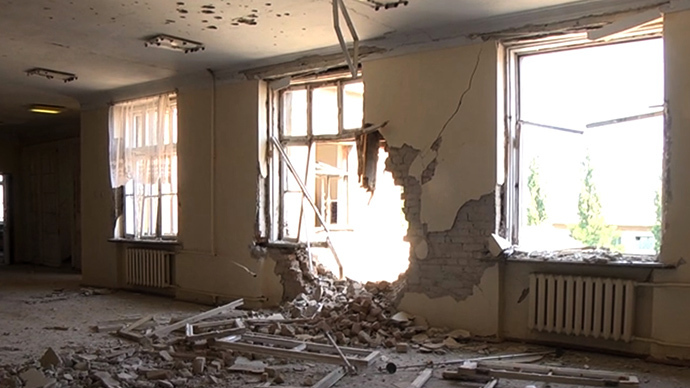 But Kiev's fighters cling to it, unlike a similar facility near Lugansk, which they surrendered to the rebels in early September, shortly before the truce was signed. 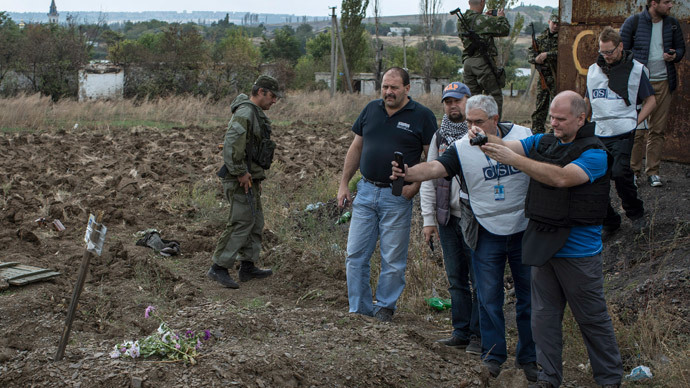 The UN stated last Wednesday that at least 3,660 people have been killed and over 8,800 have been wounded in eastern Ukraine since the beginning of Kiev’s military operation in April – including 330 since the ceasefire was brokered.